Home › Blog Topics › Advocacy/Leadership › Do people even read anymore? I’m guessing the look on your face now is much like the look on my face then. This is from an administrator that has spent the last 7 years in a school without a school library or librarian, so of course he thinks he can do without. His school may have achieved success in lots of areas, but what do they lack? A reading culture. So this admin thinks nobody reads anymore? Then that leads me to believe he is NOT one of the 93% of college graduates to have reported reading at least one book in the past year. SAD! It’s conversations like this that make me wonder where the disconnect is. Decades of research show that independent reading helps improve student achievement, but somehow not everyone is getting the message. What keeps your principal up at night? Two words: Test scores. As much as we talk about not teaching to the test, nearly everything we do in education hinges upon student achievement. As the years roll on, schedules are getting tighter, standards are getting higher, and more and more schools are turning toward computer-automated reading programs to help push students up to the next level. Does it work? In some cases, yes. In some cases, no. The truth is, it doesn’t work for everyone. So how can you convince your admin that giving students the time to choose their own books and giving them time to read is valuable? In 20 years, do you picture your students remembering fondly those 45 minutes of curling up with a laptop each week? Will they have warm memories of the comprehension quizzes at the end? Not likely. Think of computer reading programs as canned spinach. Canned spinach (or efferent reading) may be good for you, but would you want to eat it every meal? After days and weeks of the same dish, mealtimes will become less and less appealing. Eventually you will experience absolute dread as your mealtime approaches knowing what you have to look forward to. Now think of the school library as a salad bar. Yes, there is plenty of spinach. But there may also be some iceberg or romaine, a variety of toppings and dressings to choose from. If all you had to eat were vegetables, at least you would have variety and choice (aesthetic reading). So the computers do show instant feedback and have dashboards for teachers to see data. But do students prefer computers to actual books? Studies show that students exhibit better reading comprehension when reading on paper versus reading on a screen. And as far as speed, there was no significant difference between the two (researchgate.net). According to Beer and Probst (Disrupt Thinking: Why How We Read Matters), adding a few minutes per day for independent reading impacts student achievement exponentially. 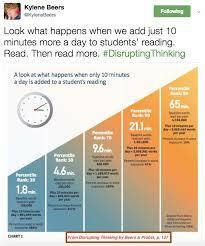 Adding a mere 2 minutes a day allows students to interact with an additional 106,000 words per year. Adding 10 minutes a day adds nearly 700,000 words per year. And 20 minutes? Students will interact with nearly 1.8 million words per year and should rank in the 90% percentile for reading. Twenty minutes a day sounds like a lot, but is it? There are a number of ways to carve out time for reading that add up. Make sure students have ample opportunities to visit the school library. Make sure students have a book handy to read once a test is over. Allow time each week for sustained silent reading (SSR). Access is crucial. If students don’t have access to books, those opportunities are wasted. If reading scores are a priority, then we need to do more than rely on computer programs to drive student achievement. We need to demonstrate that we as educators value literature and independent reading. 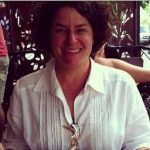 Does that mean that we need to abandon computer programs in reading instruction? No. It just means that we need a balanced diet of screen vs. paper. Encouraging students to read independently takes more effort than an anchor chart or a book fair. It’s a shift in culture. A new mindset. It’s a longitudinal effort that will need to happen in every classroom. For a more in-depth look at why how we read matters, be sure to read Disrupting Thinking by Kylene Beers and Robert E. Probst. Our students are more than test scores. Yes, we want our students to achieve, but ultimately we want to build readers that are compassionate, competent, and responsive. This change begins with independent reading. Comparison of reading performance on screen and on paper: A meta-analysis | Request PDF. Available from: https://www.researchgate.net/publication/324993558_Comparison_of_reading_performance_on_screen_and_on_paper_A_meta-analysis [accessed Sep 26 2018]. Disrupting Thinking: Why How We Read Matters G. Beers-Robert Probst – Scholastic Inc. – 2017.